This weekend Picnic on the Playa happens. There will be art installations, performances and places to hang out. 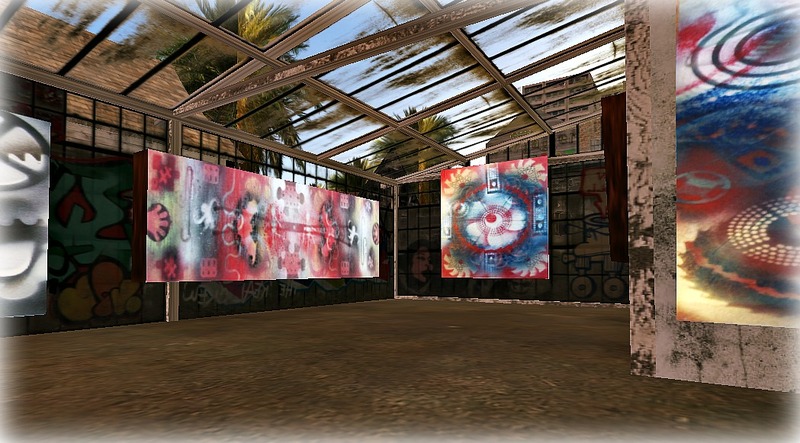 “A festival of fire, art and community… in Second Life” There will be gifts near the landing and info on how to block sounds and to remove avatars and objects from view. This piece of art must have been carried off by ants; I can no longer locate it. Ilyra Chardin’s painting camper. You can ride bikes around and play games. Float with sheep. Play basketball too. Created by Solkide Auer. This piece changes color and is quite lovely. These photos were taken a couple of weeks ago and saved in my media file here at WordPress. More has been added to Picnic on the Playa since then. Also the laptop I’ve used mostly for the last four years totally died earlier this week and I’d lapsed in backing things up. How do I feel about that? Relief, except for some regret about inconveniencing Laserkater; I’m making vimeo slideshows of the collection of historical avatars he’s made. I didn’t need to go back and take these photos though, which helps. Dive into a glass of wine and float at Camp Water Cracker by RMarie Beedit. John (johannes 1977) Breakfast Will Be Served All Day. The ant and cherry installation is the background is by Eles Brianna. There are, of course, lots of ants. And an ant-bear. More detail has been added to this meditation area by Saul GOODIE since these photos were taken. Merfolk can picnic too. Queen Eli’s plot. This happens to be the weekend I’ll be staying up all night to watch the live stream of the Merrie Monarch Hula Festival Competition, for three nights in a row. 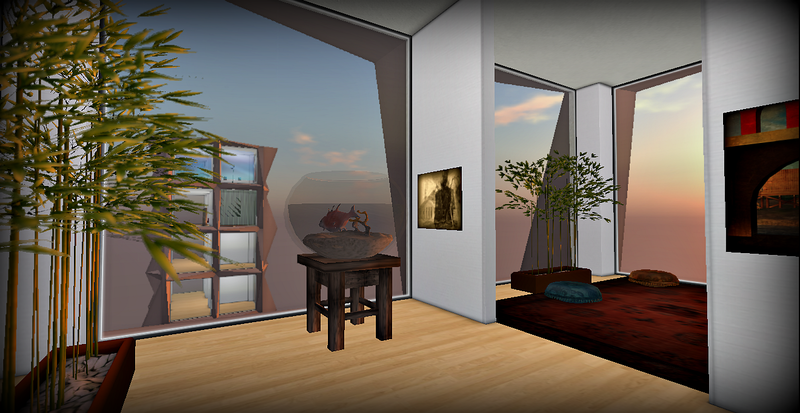 I intend to stop by for at least half an hour to see avatars here. It looks like it’s going to be a great time. 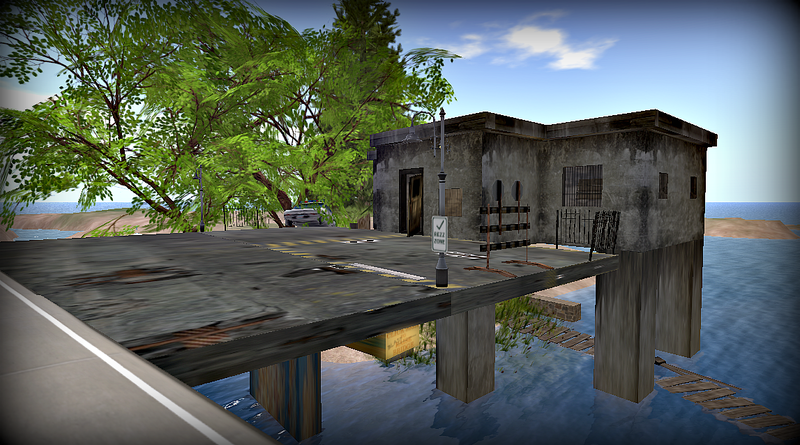 In Sansara, there’s a rez zone in Amida, near the road and water, called Garden Oasis. According to a sign, it was established in 2010. 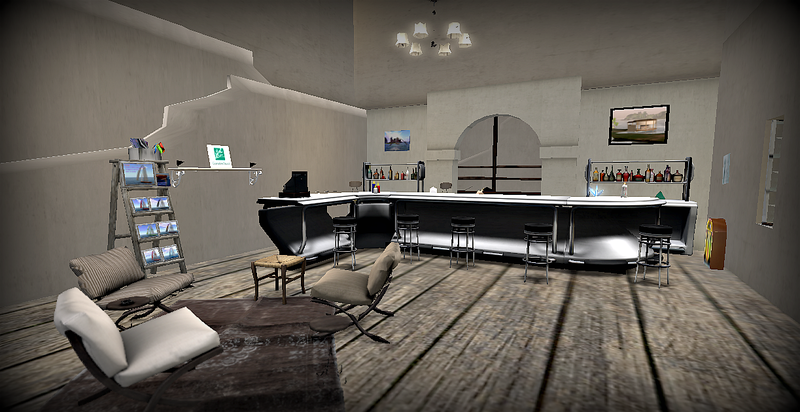 The indoor seating area has a bar. 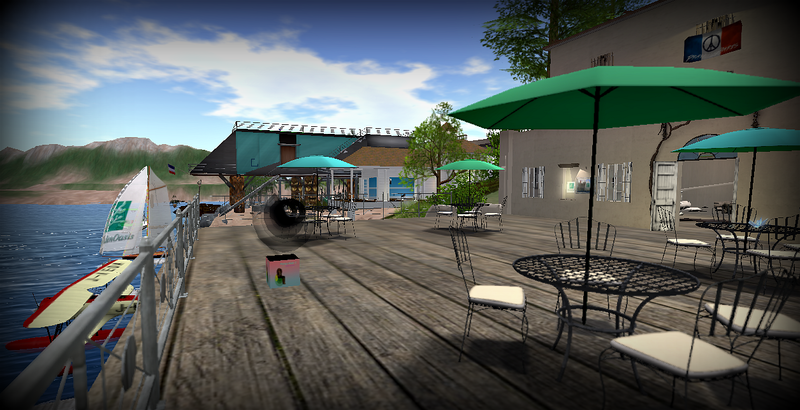 You can get a flying chair from the dispenser or use the outdoor seating. 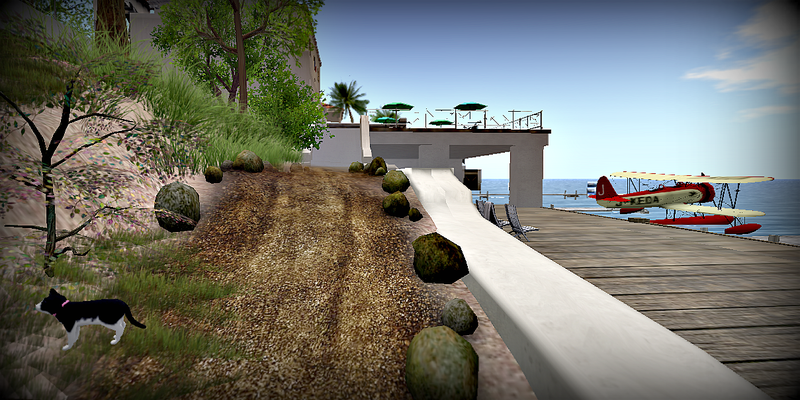 There are boat demos to try or you can rez your own vehicles. In the center of the photo above, I’m flying around in the chair. Nearby is Cinque’s Tavern. 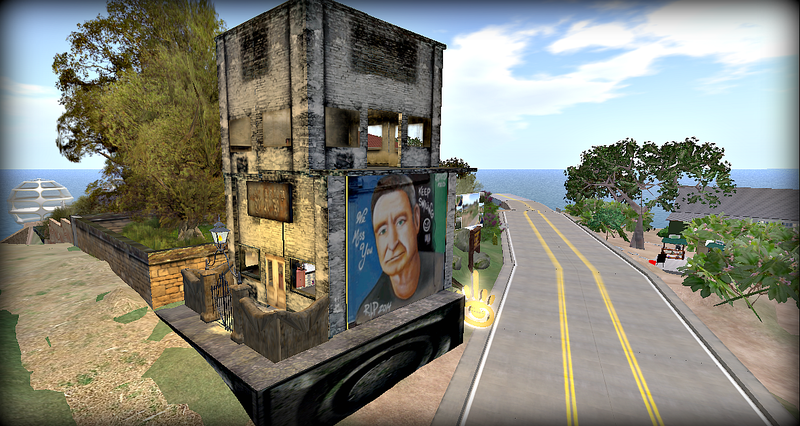 There’s another rez zone up the road in Gualala, CC Sansara – Casamento Carino. It’s an old police station and jail. The cells in back are unlocked; hobos could sleep there and stay out of the rain. For years, there had been a wooden slatted bridge. 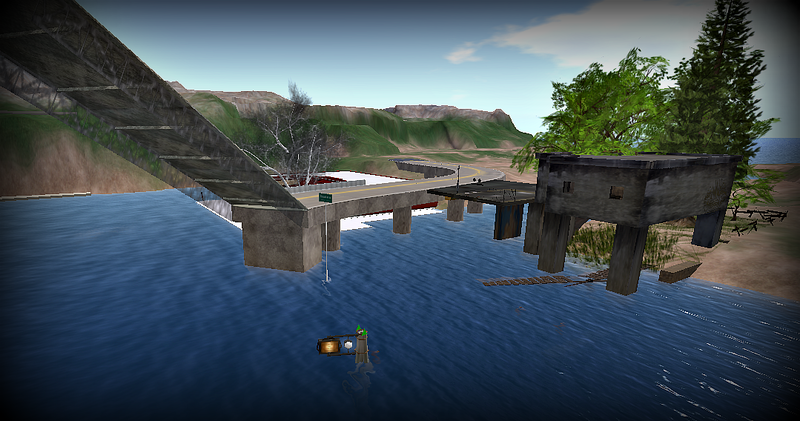 During the last couple of months a new bridge that can be raised and lowered has been constructed. Pods travel in both directions here. 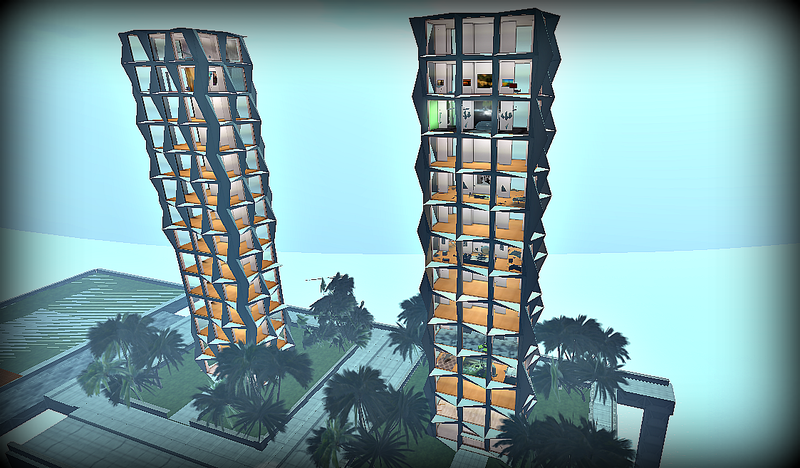 The futuristic city of Temporia Prime, Fantasyland is a residential and roleplay sim. The roleplay is optional with the use of HUDS and Titlers. 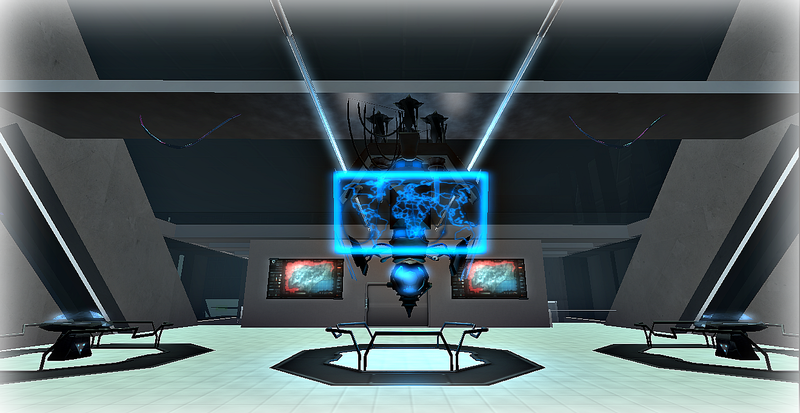 It’s also a destination for visitors; both photographers and machinimists are welcome. “Far into the future, after the overpopulation of Earth, humans set out to explore and colonise the galaxy. A distant, beautiful planet called Temporia Prime was inhabited by a colony from Earth. To maintain the exotic landscape, a large city was built above the surface. 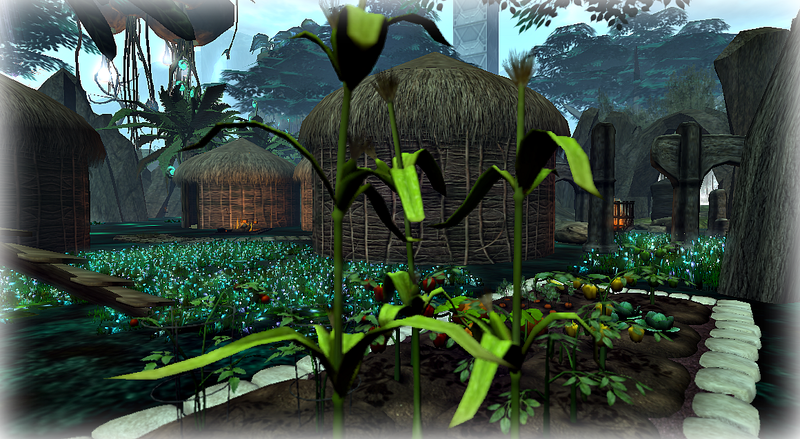 Now a few years on the colony lives in peace with the land and maintains a thriving community.” Don’t tell anyone but I located the rumored base of the Renegades hidden somewhere in Sector 2. The Shiva craft can be piloted when wearing a group (free to join) tag. They are now 10 minute demos (for clean-up purposes) which is plenty of time to travel to the other sectors. 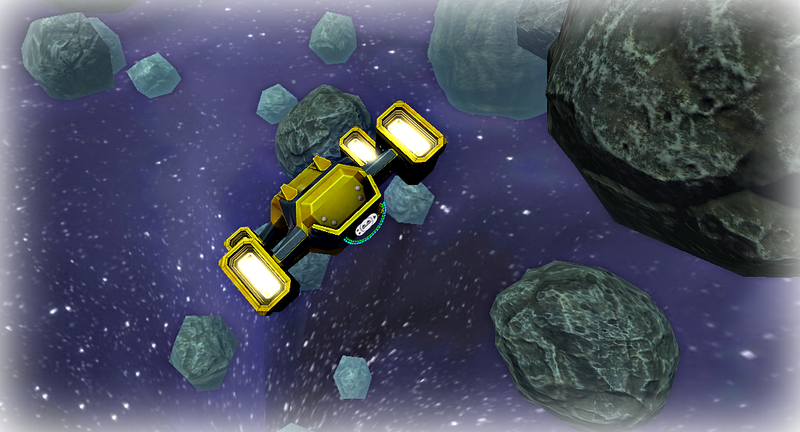 I crashed a few in the early days; my piloting has improved but parking is still a challenge. They are available for purchase. The Shiva craft and parking are near the front of this building, by Beth Delaunay, which is on the top level near the entry. 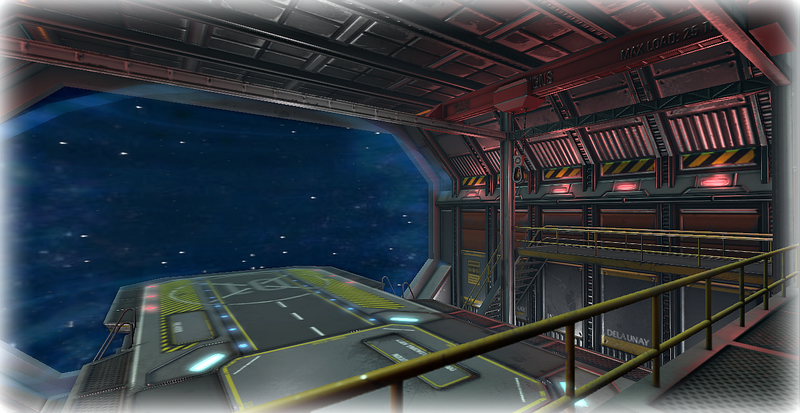 The building has a landing pad on top and houses cargo storage containers, an industrial ore refinery, plasma fusion reactor and also a sort of command office accessed by elevator. 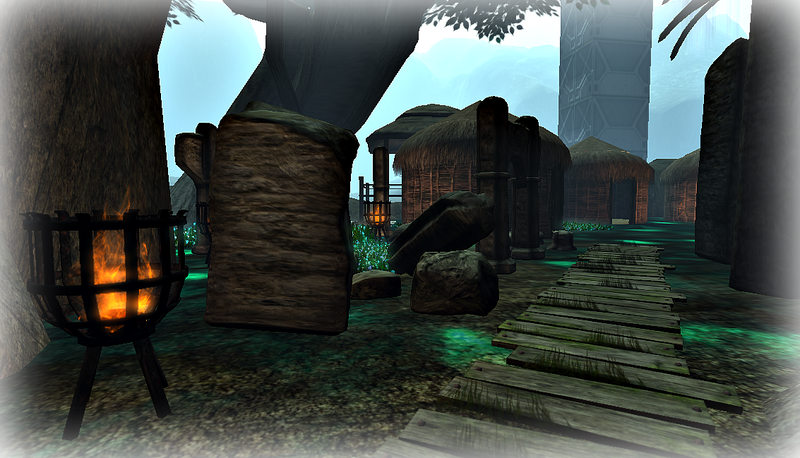 There’s a variety of residential rentals; the tribal huts on the ground level are for a roleplay indigenous community. 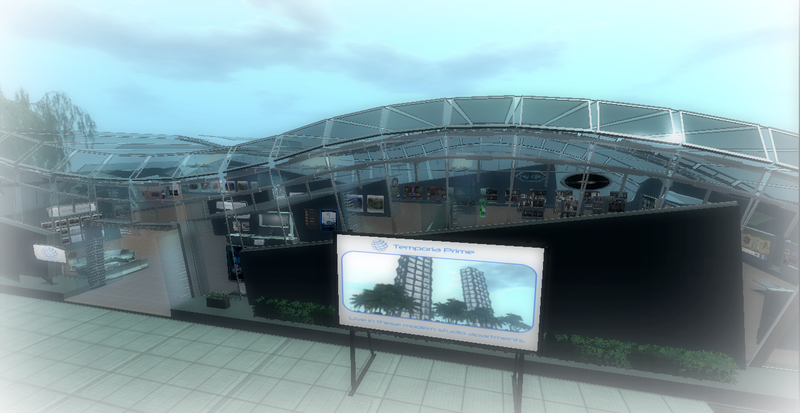 The sim entrance has teleporters to various locations, roleplay and rental information and convenient shopping for whatever one might need. 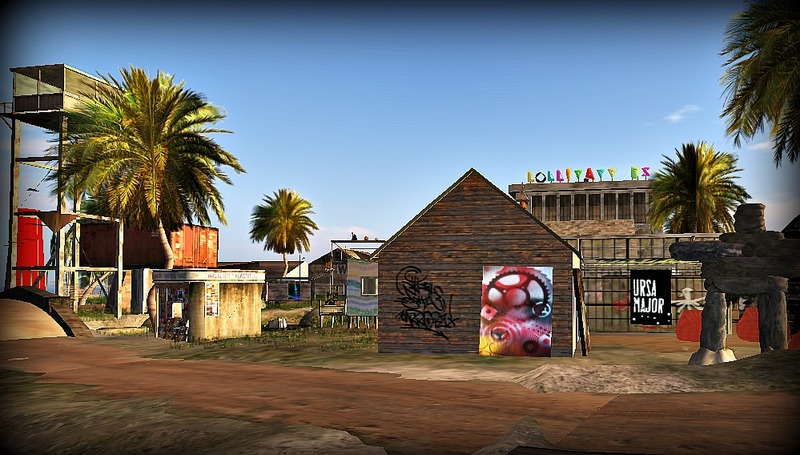 Temporia Prime will have a booth at the upcoming Sci Fi Alliance Convention, March 18–27 supporting Relay for Life of Second Life. 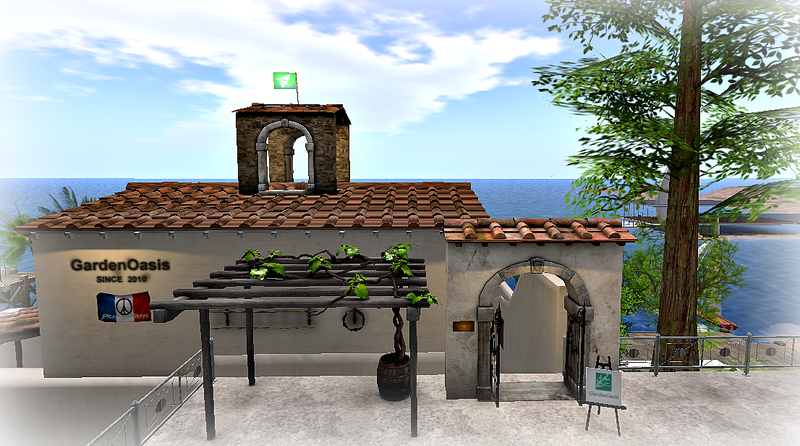 I will edit to include a SLurl here when it’s open. 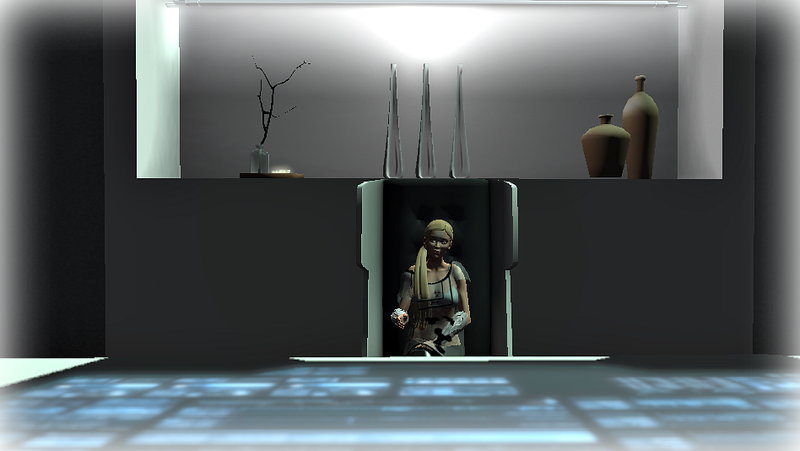 Edit: Temporia Prime booth at SL Sci Fi Convention Sometimes the Android receptionist bot, Saskia Pearl, is on duty. I’ve found at least two hangars in which I manage to enter with a craft. One leads to several areas you can beam to for various activities. 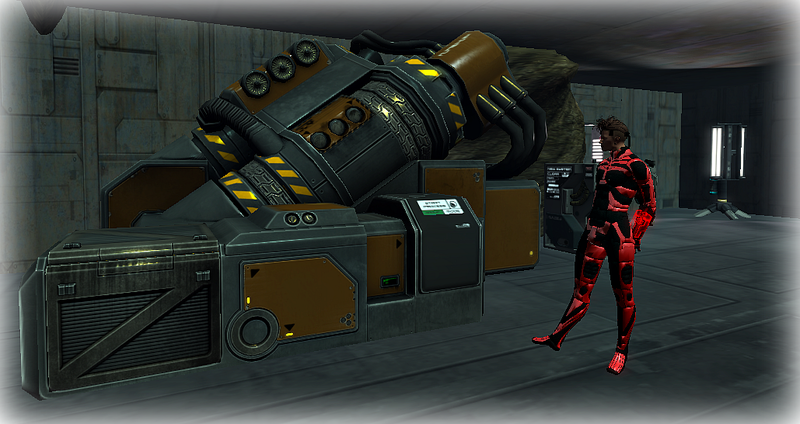 My favorite is the Cyborg Cube, even though I get shot at while being a mere civilian armed only with a camera. The other leads to a city center with a hospital, theater with working screen, the Radium Bar and the Temporia Peace Corps among other things. 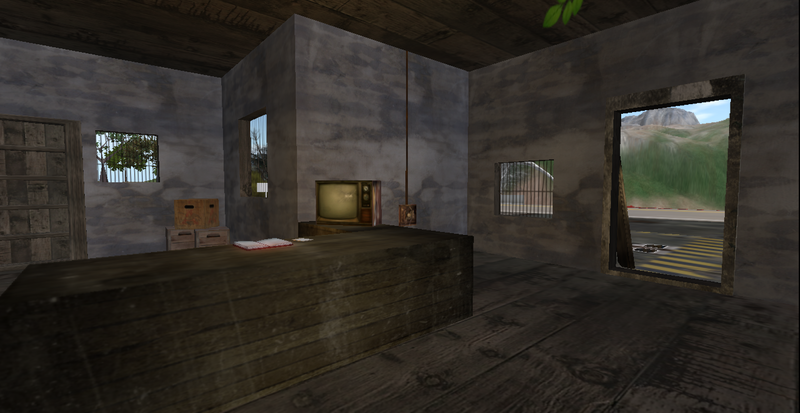 An office in the Temporia Peace Corps building. I no longer have time or energy for roleplay and I’ve called this my home base since a few days after it opened in December. What drew me in was living high up in one of the towers. it felt so spacious and light in the dark days of winter and is surprisingly comfortable being so open, with the occasional craft flying by. The architecture is by Konkel Deir. 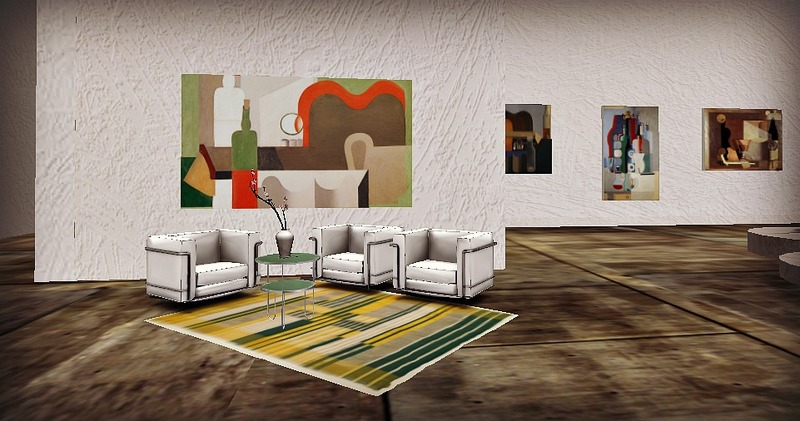 From his profile: “I am majoring in contemporary modern architecture/city development. Usually takes 2weeks to 2months depending on its scale and the custom service.” I use the studio as an office and it’s where I really became aware that I needed to have my own small gallery, which I’ve set up elsewhere. 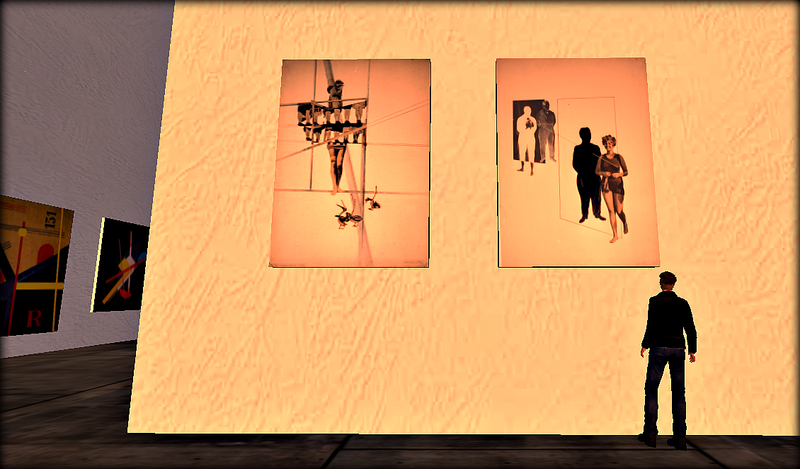 The other photos here were taken in the sim regional light setting except the one above. I use sunset moslty; the art looks better and it’s way more flattering for a human girl’s complexion. Almost all the other residents have futuristic decor; I’ve felt comfortable with my choice as well as wearing whatever I happen to have on. Most people are sleeping in other parts of the world while I’m here. 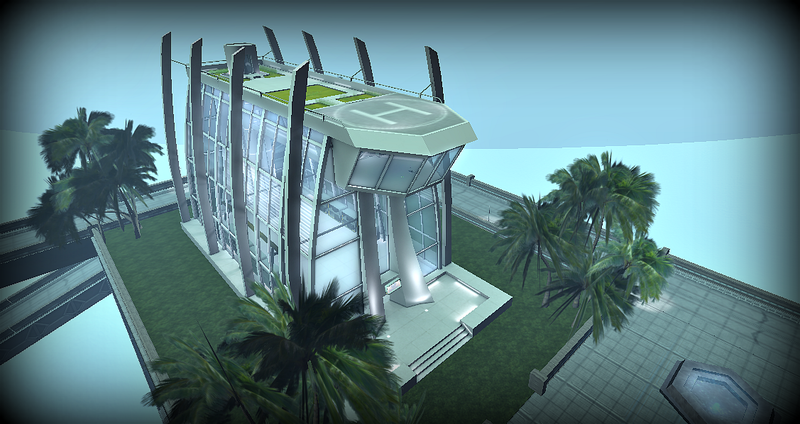 I like the satisfying sounds of the teleporters and doors opening and closing. Temporia Prime is currently rated Moderate. 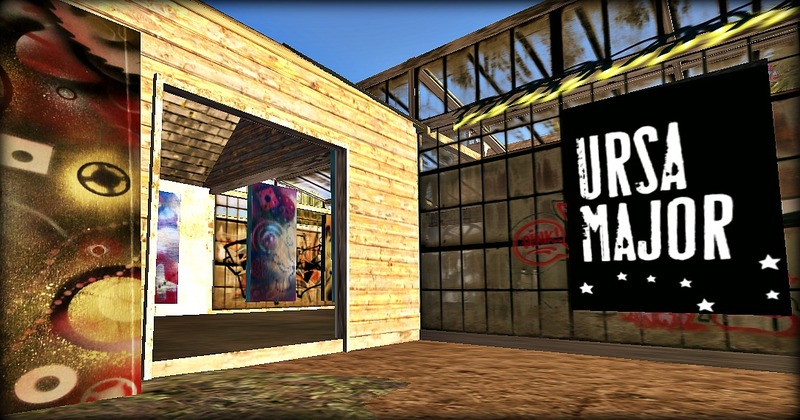 Ursa Major is one of the galleries of real life art that I think is done well in Second Life. It’s in a mainland area, Lollygaggers, that has other activity. The doors are open and the ambiance is perfect for the spray paintings. 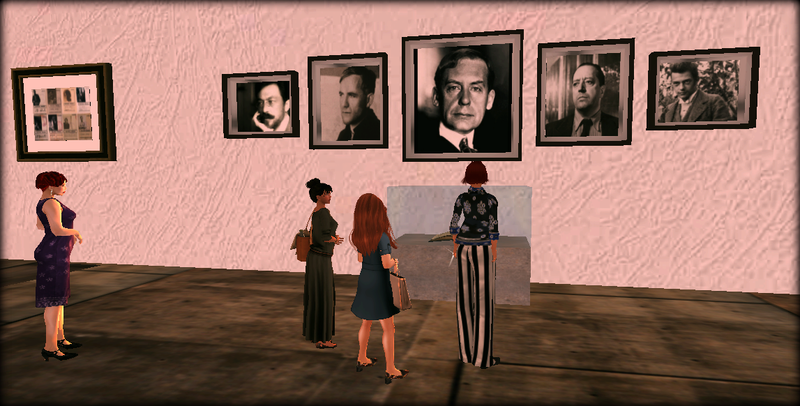 When you enter the door, there’s a large photo of the artist’s face, which isn’t at all jarring with the virtual build. Clicking on it gives a well written notecard with more information than I’ve quoted here, including links to her website and Etsy. She also makes hobo jewelry and sounds quite successful which is always pleasant to hear regarding a career in the arts. 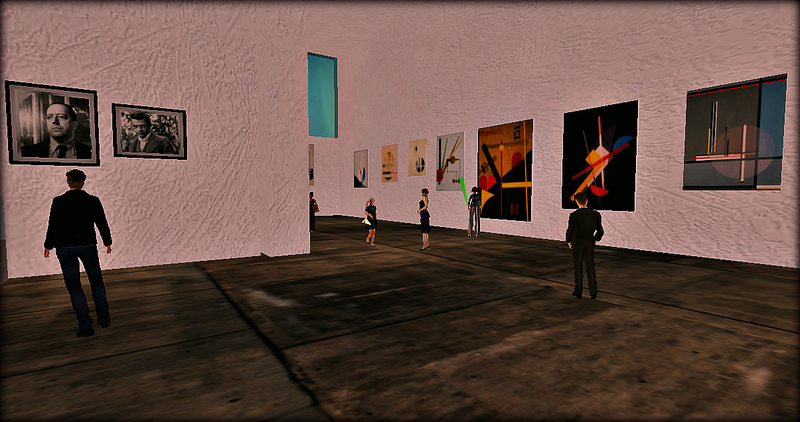 I often see galleries on the mainland with real life art. 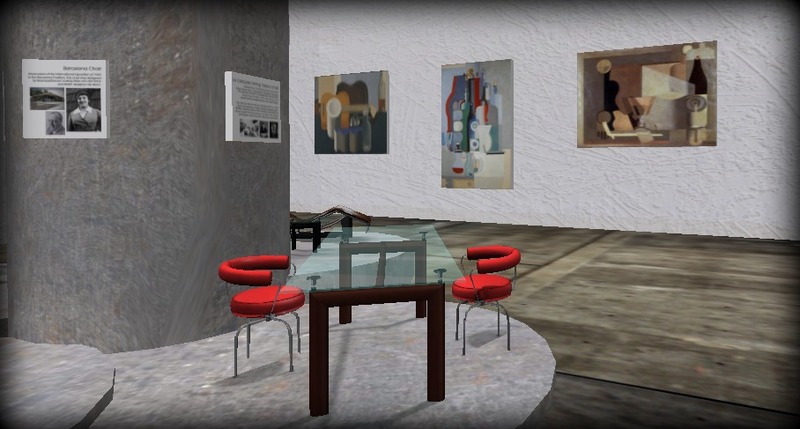 Even though it’s understandable that many artists and others don’t have a lot of time or interest to spend inworld, interacting, it feels dismal to me that an artist “has a gallery in Second Life” and it just sits there. Ursa Major feels vibrant and relevant, as is the art here.